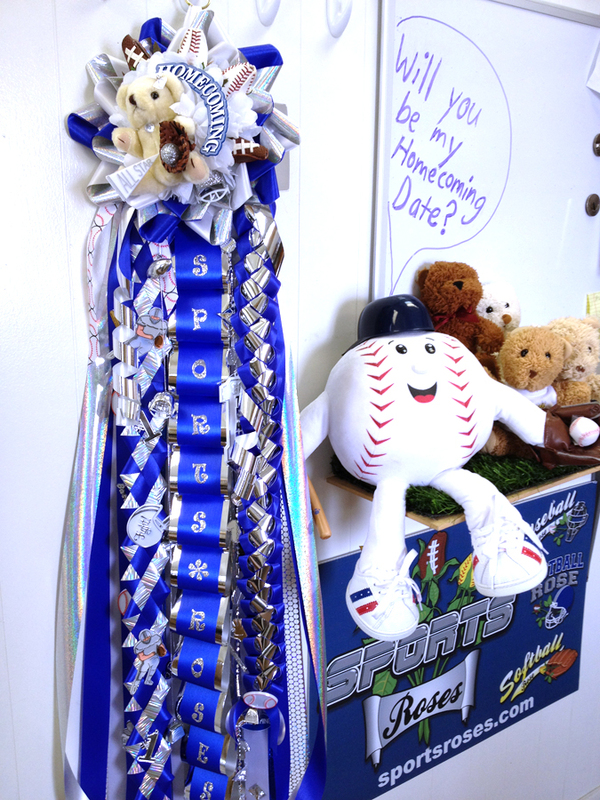 Sports Roses Homecoming Mum Ideas 2 « Sports Roses. Your passion for sports…expressed. Full view of the Sports Roses Homecoming Mum that Mr. Billy Baseball will be giving to a lucky texas girl at homecoming. The mum features two Baseball Roses and two Football Roses surrounding a miniature plush bear holding a baseball glove and ball. Ribbon chains included on the mum are a texas diamond braid chain, military braid chain, and loop chain. The name “Sports Roses” runs down the loops on the ribbon. We can only wonder who the lucky lady will be that wins his heart and his Sports Roses Homecoming Mum. Mr. Billy Baseball is still building up courage to ask her to be his homecoming date, but fortunately he has the help of a few good friends to spur him on.